Brantford we have some amazing workouts coming your way this month. It has already been a killer month and it has only just started. Lets take a look at what January is all about. We kicked off the new year by taking on a classic CrossFit Workout called MURPH. This day was a huge success all around because each of these individuals made a donation to the Brantford Food Bank! Our members took on HERO WOD CHAD. 1000 Step ups for time with weight. 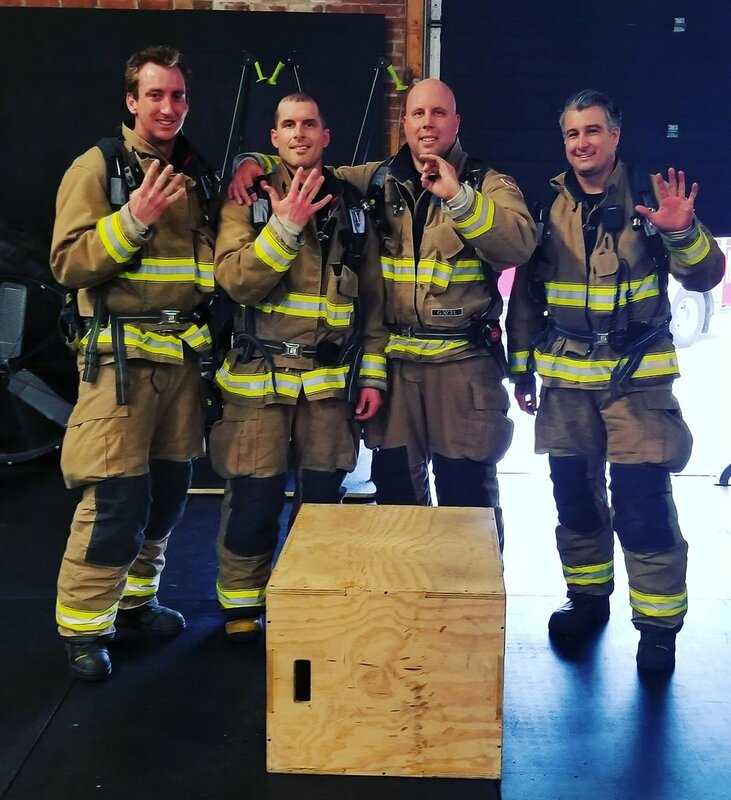 We also had some special guests join us: Thanks to The Brantford Fire Department for attending our hero WOD event today and raising awareness for mental health and PTSD. They took on "Chad" together in full gear with a time of 45:05! Overall in 2019, we want to get back to the basic principles of effective training with a renewed focus on functionality, variance, and intensity. Our long term goal has and always will be to produce the greatest amount of “fitness” -- the ability to do work across many different time domains and many different modalities (aka be a very capable athlete no matter how, what, where, and why). We hope that this broad brand of fitness that carries over outside the walls of the gym and allows you to live your life freely and fully. At CrossFit Durst, you will continue to get a highly varied exposure to functional movements as well as time, volume, and loading ranges. We will vary these elements smartly to produce effective, challenging, and fun workouts. We will use our warm-ups, skills, workouts, and finishers to build confidence and consistency to our major motor patterns. Coaches will guide members to implement intensity carefully...building bulletproof mechanics first, then consistency of those mechanics and finally boosting the intensity. We are very excited to get back to the basics! In addition, each month of programming will have a slight bias toward one of the 10 General Physical Skills. This bias might not be immediately noticeable; however, each month we will have delineated tests, workouts, skills, or drills that will lend themselves to that month’s particular focus. We will also be angling our CrossFit programming to slightly bias or adjust to the 2019 Open structure. We anticipate building our members toward these tests and then programming the tests during the Open. January’s specific focus will revolve around COORDINATION via practicing and building common skills that are tested during the Open. Weekly you will see skill development portions to help members build confidence and coordination in a skill before testing it in the workout. In particular we will focus on the Muscle Up, Handstand Push-up, and Double Under as we know these movements will show up in the Open, and we know our members will want to have a plan of attack when they show up! All this Plus our BURN and BUILD Programming. There truly is something for everyone at CrossFit Durst!